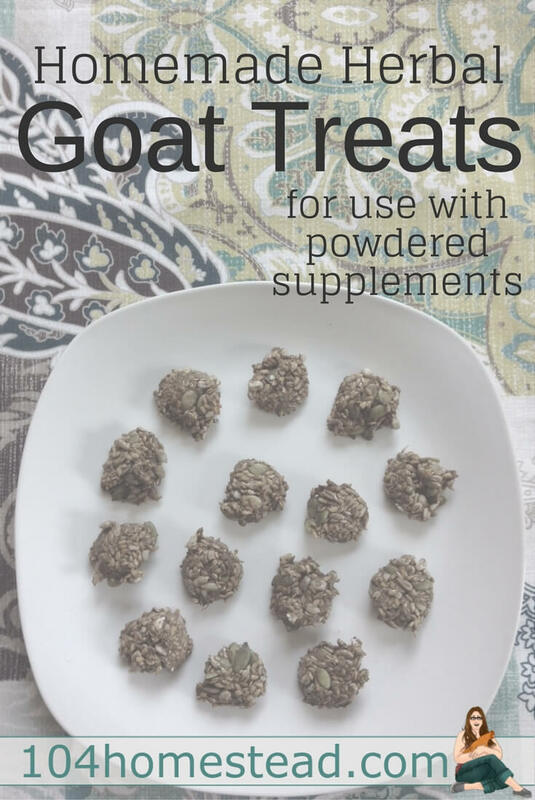 One of the things I don’t love about the herbal supplement powders I provide to my goats is that they often sift through the feed and end up an uneaten powder at the bottom of the dishes. My goats love when I made herbal balls for them, but I don’t want to have to make them for the daily supplements, like the Kop-Sel. I’ve been making the herbal balls weekly when I give them DWorm, but it seemed like there must be an easier way. Like maybe in some sort of goat treat. When you add water to flax seed it creates a gelatinous goo. I know, it may not sound appealing, but think of it as an egg substitute. That’s what it resembles. Egg whites. It binds all the goodies together, which in this case is the seeds and the spices. Because of the natural binding materials, flax seed goat treat are super simple to make. Just mix, let it sit, plop out the desired amount, and dehydrate. For these goat treats, we doing a simple flax seed treat. Once you’ve mastered the basics, feel free to add fun things like pumpkin seeds, sunflower seeds, and other goodies. Just be sure to check the safety of the grains you are adding. Fiasco Farms is a great resource for what is safe for goats to consume. Also keep in mind that your ingredients need to be shelf stable. For some ingredients, like apples, they can be chopped and dehydrated before adding them to your batter to make them shelf stable. Mix together the flax seeds and water. Let the mixture sit for about 10-15 minutes, until the mix starts to go clumpy, but not too thick. Add in the honey and herbal supplements. If you are adding other seeds or grains, this would be the time to do it. If you feel that it’s too gloopy to stir in your supplements adequately you can add more water. 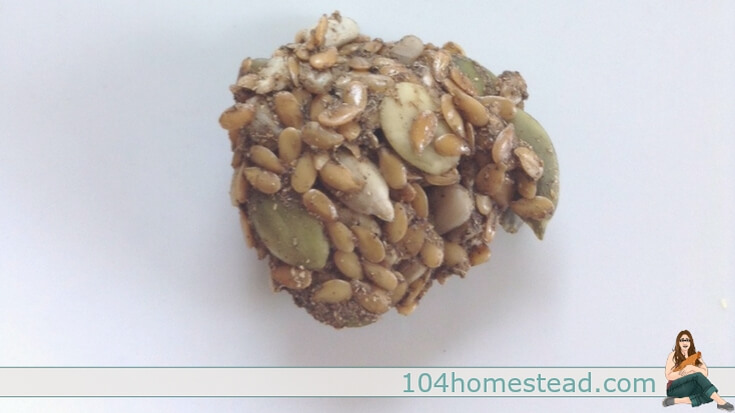 I added some pumpkin seeds, shelled sunflower seeds, and ground up peanuts to this batch of DWorm treats. Plop the desired portion of your mixture* on parchment paper or a ParaFlexx™ sheets. Because I only have one ParaFlexx™ sheet, I let the first sheet dry for about an hour and then transfer them to a regular tray so I can start another sheet. I do this until all five trays are filled. Dehydrate at 105ºF for 12 hours or until dry. I like to flip mine at around 6 hours and squish them down a bit so they are easier for the goats to eat. If you lose any seeds when you squish them, just push them back into an area that is still soft. Overdosing isn’t as dangerous with herbal supplements as it would be with conventional supplements, but you still need to be aware of the amount you are feeding your goat. This recipe makes approximately seventy (70) 1 teaspoon-sized treats. I wanted each treat to be the smallest dose for my supplements so the goat kids would have one goat treat and the older does would have 2-4 depending on size. That requires a bit of math to figure out how much supplement to add to the mixture. I use Fir Meadow herbal supplements – Better Daze, DWorm, Kop-Sel, and MilkMaid, so this is the amount I add to the mixture. Keep in mind that I don’t add multiple herbal supplements to the same treat. I do separate batches for each. For the basic flax seed goat treats (1 teaspoon-sized), I add 1/3 cup of supplement per batch. That means my young kids get one treat as needed and my adult does (Nigerians) get two. Kids that have not reached 20 lbs get a drench instead of treats. If you are adding more than 1/4 cup of additional goodies (sunflower seeds, pumpkin seeds, etc) you will need to adjust your supplements because they will make more treats. Pack the mixture in a large measuring cup and calculate how many teaspoons are in the mixture. One cup equals approximately 48 teaspoons. If you aren’t so sure you want to take the time to make your own treats, let me help you out. We recently launched a line of herbal goat treats called BiteMe! 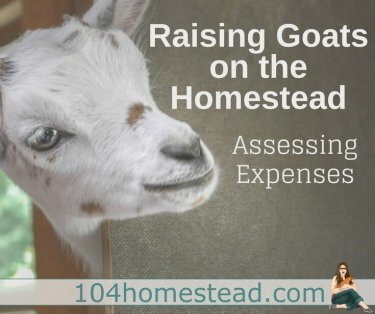 They are the healthier way to “treat” your goat. We also have a line of seasonal non-supplement treats. I have a horse in with my goat’s. Will these goat treats be okay for him to eat? If I was making these with ammonium chloride, how much would you add to get roughly 1 teaspoon a treat? Also, would you make them tablespoon sized treats? I love the idea of using treats instead of drenching four bucks and wethers a day, but I want to make sure the treats are right! Do you think milled flax seed would work okay? Also, do you find that all of your goats enjoy these treats? My does are very picky. I don’t want to waste ingredients and Dwormer if they end up not liking it. Thank you! Milled works just fine. That’s how we make our BiteMe! 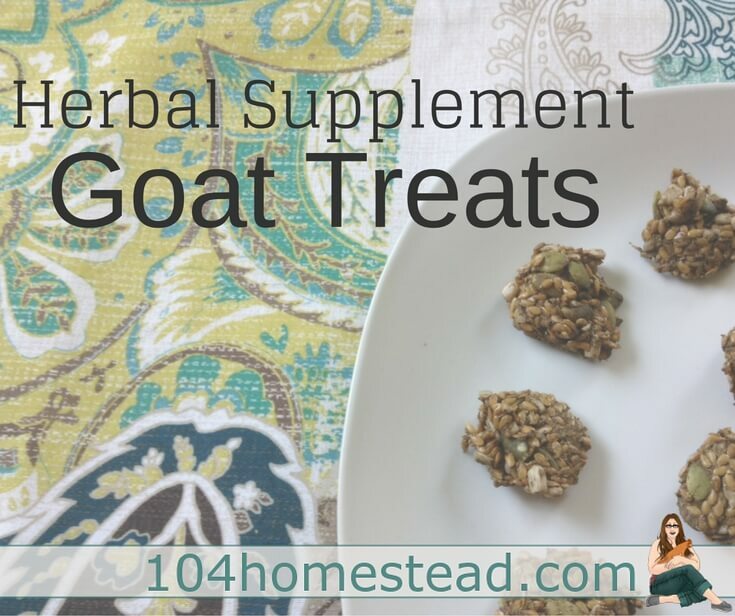 Herbal Goat Treats. This is awesome! I’ll make these for my “girls”. I bet they will love them! I like playing with words.. “GO AT it Treats” ha ha …they sound great. Good luck with it. Good luck with the project, sounds like a winner.